Ms. Hunt-Robinson immigrated with her parents to the United States in 1971. She attend New York public schools. Thereafter, she received her B.A. from Adelphi University and then a J.D. from Villanova University School of Law. While at Villanova University, she was an Articles Editor for the Villanova Environmental Law Journal. 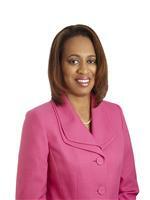 Ms. Hunt-Robinson has worked in private practice and the corporate arena, with a focus on environmental issues. During her twenty-year professional life, Ms. Hunt-Robinson has also been committed to community service. Ms. Hunt-Robinson is married to Dr. Tyrone H. Robinson, pastor of the First Community Baptist Church. They reside in the Fisher Hill neighborhood of White Plains.